The Rolls-Royce Silver Cloud was produced by Rolls-Royce Limited from April 1955 until March 1966. It was the core model of the Rolls-Royce range during that period. The Silver Cloud replaced the Silver Dawn and was, in turn, replaced by the Silver Shadow. The J. P. Blatchley design was a major change from the prewar models and the highly derivative Silver Dawn. Construction was body-on-frame, which permitted special bodied versions, though the overwhelming majority were built with the standard Pressed Steel Company manufactured steel body shell. A lightweight aluminium based alloy was used for the doors, bonnet and the boot lid. The engine was a 4.9 L six cylinder unit with inlet over exhaust valves and twin SU carburettors were added in September 1957. Brakes were hydraulic and assisted by the Rolls-Royce mechanical servo and the suspension was independent coils at the front and semi-elliptic springs at the rear. Twin brake master cylinders were incorporated from April 1956. 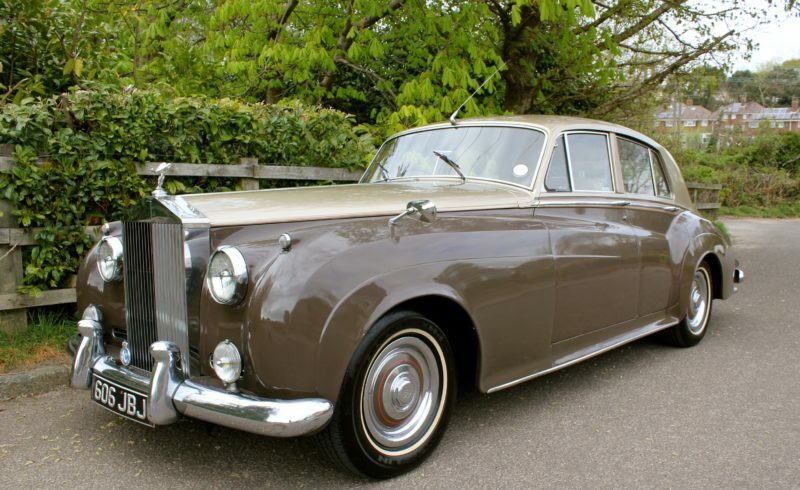 This lovely Rolls Royce silver Cloud I is being offered publicly for sale for the first time in over 50 years, having been in the current ownership since 1962! Two tone colour schemes were common throughout the 30s, 50s and 60s, manufacturers believing that a somewhat slab sided design could be made to look longer, sleeker and subliminally faster by contrasting colours. Appropriately the Cloud here is finished in the popular Sand over Sable but, in addition, the elongated effect is enhanced by a pair of very subtle red pin-stripes running the full length of the waistline. This red pin-stripe is echoed on the shiny wheel discs and when set against the Pencil Line Whitewall tyres, creates a very pleasing effect. Altogether a very pretty car. Having been well looked after and preserved the car presents very well indeed. It benefits from minimal use over the years and in the last 25 years has been maintained by a trusted local garage which has carried out it’s annual service and MoT. The car was converted to run on unleaded by Rolls Royce, who actually asked the previous owner if they could convert the car to unleaded for him free of charge. Showing an unwarranted, but plausible, mileage of 30,393 at time of cataloguing, the condition of the interior and the clean body does seem to suggest that of a low mileage 55-year-old car. Accompanied by it’s original tools and owner’s handbook the car has a recent MoT – Valid Until 1st May 2016, will retain it’s registration number (606 JBJ), and is ready for a new custodian to use, enjoy and continue it’s legacy.